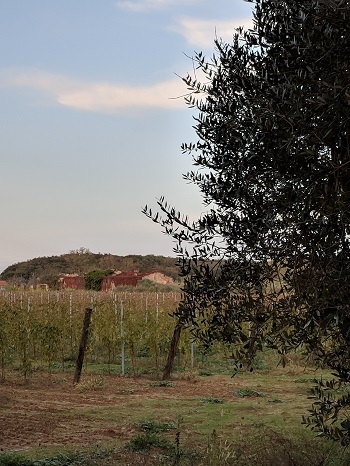 The weather was perfect for wine tasting in Tuscany in the foothills of Pisa, Italy. On the way there in the motor coach, our tour guide explained the minerals and sea breezes make for some very good wines in this region. 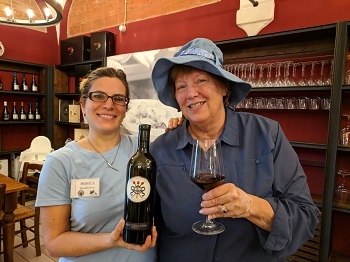 This was my opportunity to taste Sangiovese wine since I usually drink California Cab and Merlot wines. 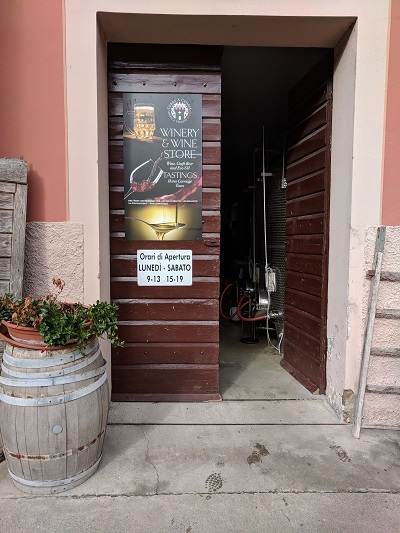 As our bus arrived at Torre a Cenaia vineyards and winery, I noticed the grounds and buildings were what I expected a Tuscan winery to look like. Movie and magazine look a likes with rustic buildings and flowing water fountains. We were told, the old estate has 30 hectares of vineyards which produce Tuscan wines with “strong personality”. That sounds so Italian! Inside the brick cellar, I looked over the barrels and became more interested in the variety of wines produced here. Once seated at a long table, Monica began to freely serve the wines. We started with a white wine and then progressed to the red wine I had been anticipating. Yes, it was good! 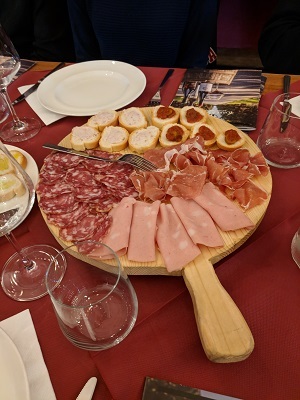 In-between sipping, I nibbled on bread, salami and cheese which had been artfully arranged on a platter. 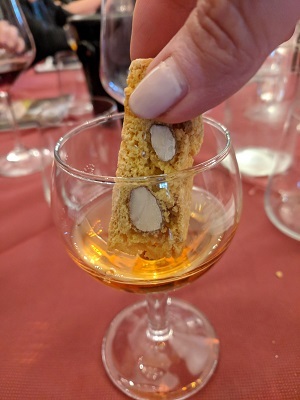 Grappa was poured at the end of the tasting, and dipping in the biscotti helped calm down the intense flavors of the grappa. I was tempted to buy a case of wine and have it shipped home but overcame the urge when I realized I don’t drink that much wine. When it was time to board the bus back to the cruise ship, we bid good bye and Cin-Cin or cheers until next time.